Ushakov said that the recent elections to the European Commission effectively put its decision-making on hold, meaning that it would take more time for the union's executive body to agree on a unified approach to the South Stream project. A new team of 28 commissioners, one from each member state, is appointed every five years. "The Commission is getting new members, so we are still to learn about Brussels" stance [on the pipeline]. We are continuing to raise awareness of the project. It's not over yet. We are ready to go ahead," Ushakov said. 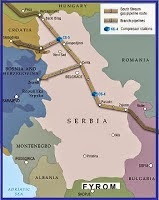 In early October, Serbian Deputy Prime Minister and Foreign Minister Ivica Dacic reaffirmed Belgrade's commitment to the South Stream project, saying it would go ahead with its construction.